The focus of this Master's Thesis was on discovering techniques to create and communicate the classic Film Noir style in an environment. 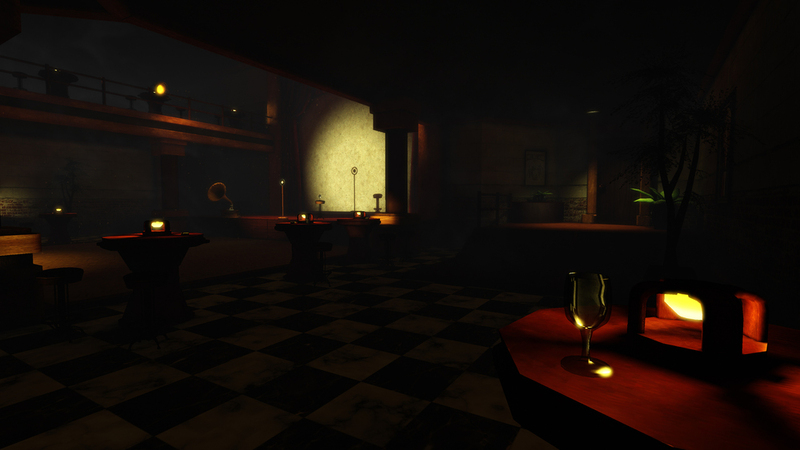 The majority of assets were acquired from Jen Huff's modular environment set for the Edison and DeadHatter Lounge. Floor and wall textures were acquired from CGTextures. I created the glass bottles and cups, fedora, poster frames, mic head, gramophone and record, upright bass, and neon bar sign. One of the defining characteristics of Film Noir is its high contrast of light and shadows, also known as Chiaroscuro. However, default UDK lightmass settings are not able to produce this effect. Lightmass gives each light a source radius from which photons emit. This creates a more realistic effect, but tends to muddle or eliminate shadows from thinner objects. In order to get the sharper and contrasted shadows, the light source radius was dropped to one or lower on most lights. The mid-tone values in the post-processing chain were raised to a 1.25 value and the highlights down to a 0.8 in order to get a sharper contrast. Below are a collection of images taken of the scene with the desaturation in the post-processing chain set to zero.